The decks name is what we want to ask our opponents every time we sit down to the table. A five color super friends deck that uses Najeela to generate an early board state & attack in when we don't have any walkers out early enough to get enough tokens to leave the tokens up to block for planeswalkers later. This used to be a Ramos super friends deck, but after some recent play testing I've found that Najeela fits the bill better. Ramos does generate a ton of mana on one turn, but becomes fairly moot in the late game other than swinging tall in the air. I can not count how many times that I've had Ramos out on turn 10+ with a lot of lands and no planeswalkers out. In that scenario Ramos can't do much & I'm purely relying on my top decks. With Najeela out in the same situation I can pump all that mana into Najeela to create additonal combat steps. The cards that get better with Najeela being the commander vs Ramos are Doubling Season, Oath of Ajani, Dovin, Grand Arbiter, Vraska, Golgari Queen, Tamiyo, the Moon Sage, & Tamiyo, Field Researcher. 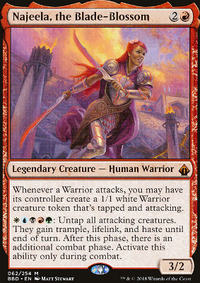 Doubling Season is of course that much more potent with Najeela as the commander. The main combo's in the deck are usually centered around two different things. Getting Doubling Season out & Tamiyo to cast all of our planeswalkers for free and immediately ultimate them, preferably with a Chandra, ToD emblem to kill everyone as we're casing spells. The other combo involves having any mana rock, Tezzeret, the Seeker, The Chain Veil & Garruk Wildspeaker out with either a mana rock or land that produces two. This generates infinite planeswalker activations. As long as you have out one other planeswalker with an ability that can win the game, you will win. Another variant of this is Teferi, Temporal Archmage. We're only running 2 extra turn spells, but both are great in their own right. 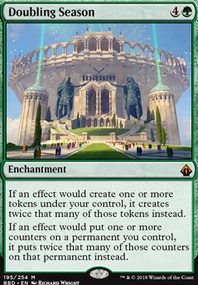 Nexus of Fate helps us not deck our selves & Savor the Moment is just one of the best extra turn spells to have in super friends. We're not running too many board wipes due to Najeela, but we do have back up plans to stop our walkers from being killed. Batwing Brume, Moment's Peace, Teferi's Protection & the infamous Cyclonic Rift are all amazing in their own right. We're running 9 ramp spells because I personally believe ramp is the founding block of any EDH deck. Amulet of Vigor is an all-star w/ our mana base & Najeela herself. Fifteen of our twenty-eight planeswalkers have an ability to deal with a creature. Something I wasn't expecting when I first started to play test with Najeela as the commander is that some of my opponents will actually not swing into my planeswalkers due to them wanting to block Najeela. This deck has morphed a few times over the last couple of years & I'm always looking for ways to make it better. That being said, I know Atraxa is probably a good fit in here & I know my mana base could be a lot better. The mana base is an ongoing project. Would 13;you 13;rather 13;die 13;to 13;Najeela 13;or 13;Ultimates?